The many varieties of coreopsis (Coreopsis spp.) are mostly perennial plants with long flowering seasons. 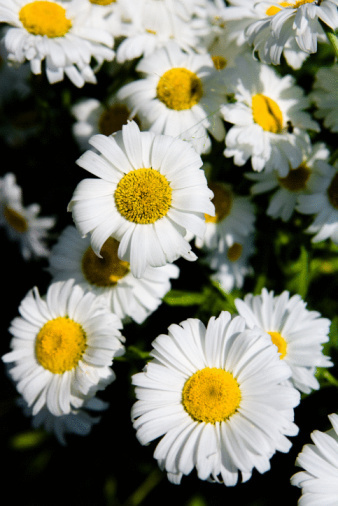 They're delightful in the garden with their abundant, daisylike blooms in yellow, white, red or pink, some with dark centers. Also called tickseed, coreopsis grow in U.S. Department of Agriculture plant hardiness zones 4 through 10, depending on the species and variety. Many varieties tolerate poor soil or hot weather. Timely pruning helps keep coreopsis healthy and may keep it flowering for longer. Before they flower in spring, cut back coreoposis, one section each week, over the course of several weeks, to control height and encourage staggered flowering. For example, using pruners, cut back one-third of the plant to within 4 or 5 inches of the ground the first week. In each of the following two weeks, cut back a different one-third of the plant. This type of pruning encourages continual flowering and conserves plant strength. You may value coreopsis plants for their blooms, which often last through the end of summer. But you won't get maximum blooming unless you deadhead, or cut off finished flowers, regularly. Using pruners, cut off spent blooms at least once a week before they go to seed. Regular deadheading will prevent your plants from wasting energy in producing seeds and stimulate them to keep flowering. Frequent deadheading also helps prevent self-seeding and nuisance seedlings. 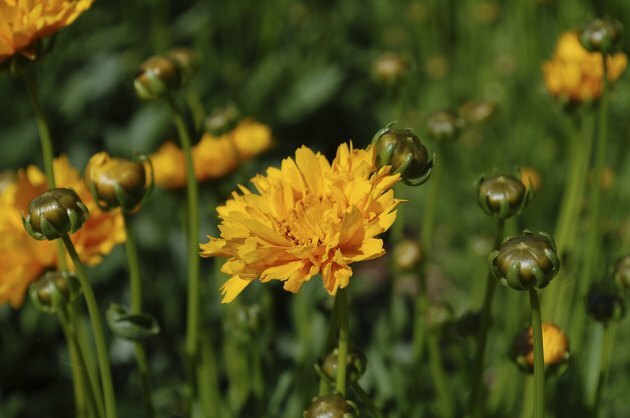 Most species of coreopsis are resistant to pests, but they can be subject to leaf spots if the season is wet. Normally, the first flowering occurs without problems. But when leaf spots appear, new growth will be sickly unless you cut the plants back. Using hedge shears, cut the affected plants back drastically enough to remove the damage, near to the ground, if necessary. While some species of coreopsis are compact, others spread and become leggy and sprawling. In midsummer, cut back any plants that have become unattractive. Using hedge shears, cut them to within 4 or 5 inches of the ground to encourage a bushy and compact plant. Coreopsis ariculata "Nana" has a sprawling habit and spreads up to 2 feet. It produces yellow flowers May through June and is hardy in USDA zones 4 through 9. In late summer, cut back coreopsis plants if flowering has slowed or stopped. This will help encourage fall blooms, notes Cornell University's Home Gardening site. One cultivar that benefits from this pruning is the "Badengold" large-flowered tickseed (Coreopsis grandiflora "Badengold"). Using hedge shears, cut the plants back to ground level or almost to ground level. This severe cutting back gives them a fresh start for healthy new growth. When coreoposis has stopped blooming in fall, you can let the flowers remain on the stalks without pruning to provide food for wild birds. If you wish to prevent self-seeding, cut them down with hedge shears, and gather up the spent flowers and seed heads. It's important to use clean pruning tools. Clean your pruning tools and disinfect them before using them or between plants if there's any kind of disease present. You should also clean and disinfect them before you put them away. Soak them in a solution of 1 part bleach or pine cleaner to 3 parts water for five minutes. Allow them to air dry before storing them or wipe them dry if you're using them right away.